I wasn't too happy about going to a funeral on my birthday, but the unfortunate timing did have a silver lining in that we decided to take an extra day driving back from Minneapolis and use that mini-vacation to do something celebratory. Almost as an afterthought, we threw a couple of demo Brompton folding bikes into the trunk before heading out of the house. This is a beautiful thing about Bromptons: the spontaneous one-day vacation we were able to take would have been far more complicated (and probably would not happen) with conventional bikes. The sign in fact said Cannon Valley Trail, but we decided to ride it anyway, and it ended up being one of the most memorable and beautiful rides of the year for us. Cannon Valley Trail was designated a National Recreational Trail earlier this year. This designation is a formal recognition program for outstanding trails of local, regional and national significance. Surprisingly, this trail was our first encounter with trail day fees. In this instance I can honestly say the $4 per person contribution was well worth it. Cannon River Trail is one of the best maintained trails I've ever been on, with beautifully landscaped bike rest areas, complete with self-service bike repair stations over the length of the trail. The trail parallels the Cannon River, connecting the towns of Red Wing and Cannon Falls in SE Minnesota. All along the way, you can catch stunning views of the Cannon River, as the the trail meanders under lush canopies of hardwoods, beside steep slopes with exposed rock ridges, and along peaceful country roads. 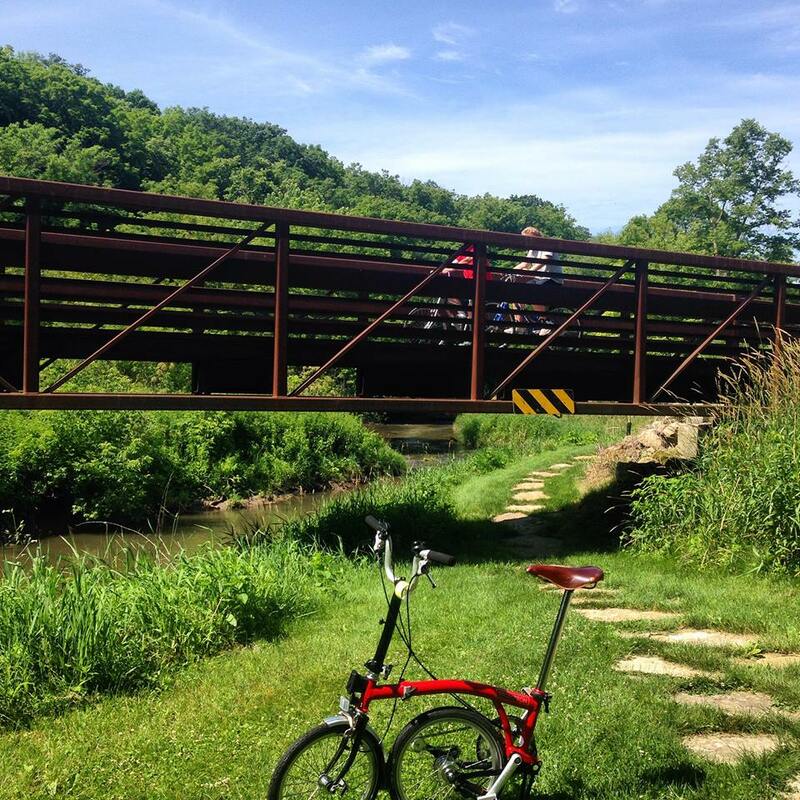 Our Bromptons performed admirably on the gentle upward climb from Red Wing to Cannon Falls. The striking mix of wetlands, river bluffs, several large lakes along the way put us in mind of one day combining a bike trip up the trail, and a return trip downriver by kayak (maybe next year!). In the town of Cannon Falls the trail climbs up toward the downtown area with beautiful view of the sprawling waterfalls. There are, of course restaurant and other amenities, where you can fortify yourself with food, cold beverages and ice cream before embarking on the downhill return trip. And there is, in fact, a kayak rental place in town, so our pedal/paddle plans may become reality. I could not take a shot like this. This one comes straight from the Cannon Valley Trail website. Getting there: while not exactly a Chicago day trip, this trail is certainly easy to reach an enjoy (and highly recommended) for anyone taking a road trip to the Twin Cities region.